Bradley Roby is listed as day-to-day and might not be able to play in the Orange Bowl on January 3. The Ohio State cornerback is still recovering from a knee injury suffered in the Big Ten championship game Dec. 7. With the Orange Bowl four days away, Ohio State is facing the possibility of taking on a high-power Clemson offense with a significantly short-handed defense. Luke Fickell, the Buckeyes’ defensive coordinator, told reporters Monday morning that All-Big Ten cornerback Bradley Roby and middle linebacker Curtis Grant are both battling injuries while rush end Noah Spence continues to deal with an off-field issue that prevented him from traveling with the team from Columbus to Miami. Roby is continuing his recovery from a knee injury suffered in the Big Ten championship game Dec. 7 while Grant has a back issue that limited him for much of the second half of the season. Fickell described Roby as day-to-day but was less clear on the likelihood Grant is able to play. If Roby is out, he would be replaced by sophomore Armani Reeves while Grant’s absence would likely mean sophomore Camren Williams plays in the middle when the Buckeyes are in their base defense and Joshua Perry does so in nickel situations. BUCKEYES TO WEAR ALTERNATE UNIS? Perry, a sophomore who starts at Sam linebacker in the base defense, had hand surgery late in the season, but Fickell indicated that no longer limits him. Filling in for Spence at the Viper or rush end if he is unable to rejoin the team before Friday will be junior Steve Miller and sophomore Jamal Marcus. "Jamal brings that aggressiveness and that twitch and fire to the edge, I can assure you that," Fickell said. Both played at times in relief of Spence this season with Miller making six tackles for loss (including three sacks) and Marcus notching a pair of sacks. "Those guys are on scholarship for a reason, and it’s time for them," Fickell said. Spence was a first-team All-Big Ten selection after finishing the regular season second in the conference with eight sacks and sixth with 13.5 tackles for loss. Fickell also confirmed a shakeup is in the offing in the secondary that struggled much of the season, particularly in the last four games when the Buckeyes allowed an average of 340.8 yards per game through the air. Redshirt freshman Tyvis Powell, who spent the season as the Buckeyes’ No. 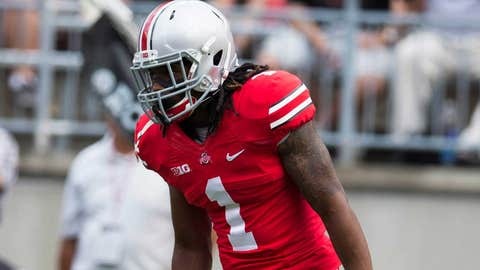 1 nickel back or "Star", is slated to start at safety while true freshman Vonn Bell takes his spot at nickel. That means Corey "Pitt" Brown, a senior who struggled for much of the season after replacing the injured Christian Bryant at safety, would go to the bench for his last college game. "I think Vonn right now is listed as our nickel with some injuries and issues we’re dealing with," Fickell said. Clemson’s offense ranks 11th in the nation in scoring at 40.2 points per game and 13th in total offense (502 yards per game) while boasting the nation’s No. 12 passing offense (329.3 ypg. ).